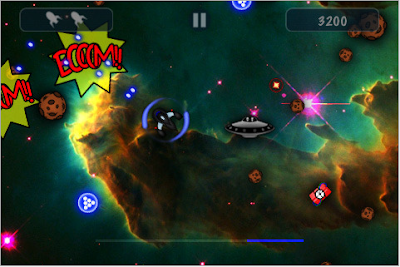 There’s a new comic book styled asteroids game for the iPhone and iPod Touch called Cataica. If you’ve ever played asteroids before you know this game is super simple but actually pretty fun. It won’t hold your attention for hours, but it’s a nice quick distraction. Right now it is free. Have fun. Maybe this is old news to some, but I just figured it out recently: you can add accents to letters by hold the letter down. For example if I want to add an o with a cute little umlaut (ö) you just hold down the “o” and bingo, you’ve got a whole slew of choices! The Japanese dictionary app called, simply enough, Japanese is being updated. Version 2.0 is coming out soon. The developer, CodeFromTokyo, has said the app will be submitted to Apple this week. I’ve been studying Japanese seriously for about a year now, I’ve already spent about a week with a beta version of 2.0 and I feel like it is safe to say that this app is an amazingly useful study companion. Why? Japanese is based on Jim Breen’s freely available EDict, like a pile of other apps. What makes Japanese different from those other apps is what it does with the dictionary and what it adds to it. Lets take a look at just few of things that I like. Bear in mind these are screenshots of the beta version, so some things might change. This is the beginning of the entry for for 素晴らしい. As you’d expect you get the furigana, any alternative pronunciations, and the translation. You’ll also get the new example sentences! Example sentences are really important because you can see if it’s the right word and how to use the word. Tapping on the sentence sends you to a page showing the sentence complete with furigana. One of the most useful features is the conjugations, which show not just the formal and informal conjugations, but also also things like the て, ない, and a handful of other forms. Of course if you are looking at a kanji you can also see a list of popular compounds. You can also search by radical or even grapheme. But even more impressive is that you can search using conjugated words, a feature that I haven’t seen in any iPod/iPhone dictionary. The dictionary also lets you write notes for a word or kanji and even create lists of words which can then be practiced in a flash card function. Well I finally took the plunge and bought an iPod Touch. Why? Because I needed a Japanese dictionary and the iPod Touch seemed to me to have the best array of options. 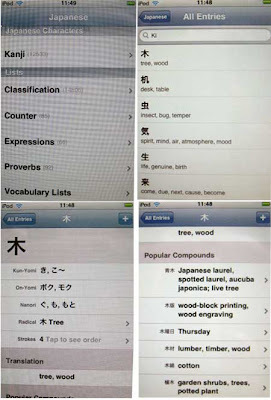 Not only do I get an iPod with all it’s potential, but I also get a 電子辞書 (electronic dictionary). A much better deal than those dictionaries designed with native Japanese speakers in mind. I bought Japanese by codefromtokyo and so far I am very pleased. It uses the same free dictionaries that many Japanese English dictionaries use, so that isn’t its selling point. The selling point is the implementation. First of all it has several handy lists. These lists range from proverbs, to expressions, to counters, to JLPT (Japanese Language Proficiency Test) vocabulary. Those are nice. But the really nice part is when you get into the dictionary itself. Neatly displayed are the On and Kun readings, the radical, a stroke animation (though not for every Kanji), a translation and compounds using the Kanji (where applicable). You can add any word to your vocab list. I have only two criticisms. The first one is more a small annoyance. If you leave Japanese it won’t remember where you were when you come back. Not ideal, but not terrible. The second is that you can’t really do anything with the vocabulary lists. However, on the developer’s there is a email address and a note asking for suggestions. I sent one saying that flash cards make from the vocabulary list would be useful and within 24 hours (much less actually) I got a response that it was already in the works. Japanese is worth buying. The developer is active and responsive and the application is well done. Go buy it.